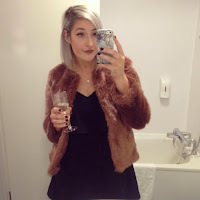 Floral Danielle: #VintSetFest - An evening of vintage blogger loveliness! #VintSetFest - An evening of vintage blogger loveliness! Last night, me and Sara decided to trek down to Birmingham for a bloggers event we had been invited to by the lovely Charlotte from The Vintage Set. It was quite a long journey (2 hours each way) but it was totally worth it and we both had a lovely time! There was so much fun stuff to do while we were there including getting some lovely nail art, browse all the vintage clothing and jewellery stalls, hook-a-duck to win a prize, there was a BBQ outside, goodie bags for everyone, a live band, a Q&A session with people from The Clothes Show Live and lots more! There was so many lovely other stalls to look at too selling everything from clothing and accessories to hair products and iPhone cases! I was very tempted by a couple of the rings, the granny sunglasses and the £5 treasure box full of clothes! We were all lucky enough to receive a goodie bag full of lovely samples and products, we could grab some sweeties from the Candy Bar and we all queued up to get our nails done by Rosie from Nails By Rosie who is super talented, and I really want a whole set of sunflower nails now! The cute little #VSF bracelet that we all received before the event / My sunflower nail art that I had done at 'Nails By Rosie's stall / All the lovely goodies I picked up at the event! Did you go along to the event too? Please leave your link below if you did! If you look up the hashtag #VintSetFest on twitter and instagram you can see lots of lovely pictures from all the other bloggers which went along too! Looked like you had such a good time. The sunflower nail art is amazing! Hey I was at the event :) shame I didn't get chance to speak to you! This looks amazing! Hope you had a lovely time!